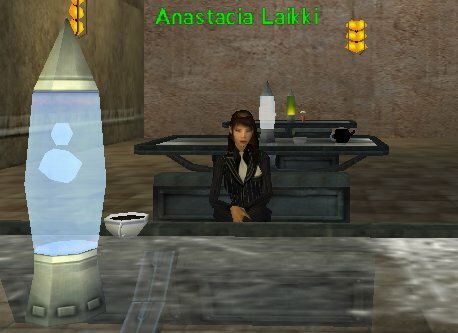 This April 20th I was contacted by Commander Windguaerd on behalf of Miss Anastacia Laikki, one of the neutral candidates for the position of mayor in the city of Borealis. Noticiero: I'm surprised you know Commander Windguaerd, even more that he contacted me to interview you. Does it mean that you have strong relations with military clans? Laikki: I have sources in many Rubi-Kan areas that can inform me of people that can get jobs done. I was told he knew you and that he'd be able to get hold of you. Laikki: I'm not a militant person, I don't see war as a way to solve everything, which is why I carry a briefcase, not a plasma-projector. Noticiero: Oh yeah...unfortunately the Commander can get a hold of pretty much anyone...it can't be helped. Laikki: See, that's exactly what Borealis needs. People that can get jobs done. Laikki: and the benefit of being neutral means that we can pitch to either side. Noticiero: During the first meet and greet some members of the audience thought you were too...well, political. Red tape is more expected from Omni-Tek than from neutrals. Do you think most things can be solved through politics? Laikki: Simply put, some things has political undercurrents, some do not. Laikki: In my off-world experience mind... I have noticed that things can get pretty bad if politics are not considered. Laikki: I've said before, and I've said again that I do not support Omni-Tek or the Clans exclusively, but will do all that I can to make sure that the Neutrals come out on top. Laikki: Some seem to think that my statement of &quot;I will join the winning side&quot; meant that I'm Omni-Tek Affiliated. Well you are more than welcome to check my background on that, but I can assure you I have had no dealings with Omni-Tek to the point of an alliance. That's quite frankly absurd, because to do so would make me more Omni inclined, not neutral. Laikki takes a sip of her coffee. Laikki: I hope that answered your question. Noticiero: How can you accomplish being 'on top' when the neutrals are the minority on Rubi-Ka? Laikki: No-one wins in wars. Laikki: The opponents in wars die, they wear each other down, diminish their resources and pull on the support they can get from around them. Laikki: Eventually, the downward spiral would result in those not involved in the conflict to become the greater party. Noticiero: So your plan seems to just allow clans and Omni-Tek to go at each other until the neutrals become the stronger faction? Laikki: Well with all due respect, it's not our war to fight in. Laikki: I will be ensuring a significant defence force for our territory is in place, and I mean DEFENCE, not offensive. Laikki: If there comes a time when one of the sides believes they want to take a pop at the 'minority' they'll have made a grave mistake. Laikki: Because I'm quite frankly not willing to sacrifice the lives of my people for the sake of a naive belief that we won't ever feel the effects of it. Noticiero: Well, that approach does not seem realistic. People arrive on Rubi-Ka every single day and most join either the clans or the corporation. The chances of either side going down to the point where neutrals are in a position of power would take quite a long time, centuries perhaps. That is if the Notun does not run out by then, which brings the question, how will you deal with the NLF? Laikki: with all due respect, the nanomage breed survives on notum the same as we do air. In notum mining, you're essentially slowly tying a noose round their neck and intending to hang them out to dry. Laikki: You for one, being of a clan orientation and all are one for freedom, you fight for it every day, how are they any different to you? Laikki: After all, if you had your limited supply of air shipped off planet each and every day to be sold to some corporate fatcat’s, would you be happy? Laikki: All I'm saying is that I'm not for wiping out a breed, even if it means restricting or outright removing notum mining. Noticiero: I'd be quite unhappy, but not sure if I would bomb locations where innocents may reside just to make a point. Laikki: Until you are in their shoes, your voice silenced and your cries for help unheard you can't really say. Noticiero: NLF has been labelled a terrorist organization even by the Council of Truth and the OT Board of Directors. Laikki: My studies off world into politics and people have taught me this; never prejudge anyone, extremist, reserved or otherwise. Laikki: and the clans haven't been labelled terrorists by the Omni-Tek Board of Directors after bombing the notum mines in four holes back during their liberation? Noticiero: So the fact that the NLF continues their attacks on both sides therefore affect the neutral image of...neutrality, does not bother you? Laikki: One mans terrorist is another man's freedom fighter. Laikki: I intend to be working with the NLF, negotiating with them for an alternative way in this, they have the nanomage interests at heart and will not see their breed die out. Laikki: I intend to be the unanimous voice behind them, ensuring that they get heard. Noticiero: The mines were bombed after the clans made sure no innocent miner was in the vicinity, omni-tek personnel did perish, but were insured. Laikki: and how can you guarantee those 'innocent' people you spoke of weren't part of a pro-mining organisation? Laikki: Next question please, I'm not here to pick at straws. Noticiero: Ah, that is a wise political stragety, the NLF has a lot of member, which would guarantee a good nunber of votes if they support you. However there are two nanomages running for Mayor, do you think you're at a disadvantage by being a Solitus? Laikki: I have heard of a certain dislike for Solitus as a breed, after all, it was our breed that created the nanomage and atrox breeds. But, I had no personal hand in that, I haven't been born *that* long, and I'd work as hard as I can to ensure that we aren't all tarred with the same brush. Making sure that people realise that I'm no ordinary gal, that I do have peoples interests at heart and that I do listen. Noticiero: How are you financially backing your campaign for mayor? Laikki: I've setup trade links with the worlds I've been to during my political degree and subsequent studies. These include worlds governed by ICC, Sol Banking, et cetera. Laikki: They'd be used to secure interests in Borealis, and develop it further. Laikki: There's a lot of interest in Rubi-Ka, and has become quite a hotspot since Omni-Tek are attempting to run a monopoly here. Noticiero: That is interesting, other corporate interests. If you become mayor how will such interests influence your decisions? Laikki: Well first I'll be discussing with my council; a proposal for Borealis. Ie: What we want, where we want it, how we want it and most importantly, when. Said proposal will be formalised and sent to the political contacts I have offworld to be presented to them. It may involve some sponsorship, but they have been mostly receptive of the ideas. The one that's the most receptive would of course get the major play in the contract. Laikki: They'd be playing by our rules, and of course if that started to conflict we'd have to reconsider their plans for this planet. Laikki: Seek alternative investment perhaps. Noticiero: So Borealis could get a big facelift with new guards, new businesses and better security, but most would be funded from off-world interests. Don't you think that you're taking a risk of allowing other corporations and outside sources have a large investment and ownership of Borealis in the long run? Laikki: The 'interest' is only a catalyst for the development of Borealis. Laikki: The contracts for them are short term, two years maximum, and thus we'd develop up a significant import/export business during this time as business flourishes and we'd pay off the short term sponsorship with that and support ourselves from there on in. Noticiero: Well the way I see it, and correct me if I'm wrong...billions of credits will be available to improve Borealis. Laikki: I can't confirm exact numbers right now, but if the off world interests are as keen as they say they are, Borealis could look like Jobe, but at a lower altitude of course. Noticiero: That is impressive, would this be a promise as part of your campaign? Laikki: ...I've also been in contact with Miir, they'd be very interested in getting a branch here. Laikki: It's the voice of the people I want to hear first. Laikki: They're the people I'm out to do this for, not myself. Laikki: Yeah I find Jobe impressive, but if the mass want Borealis in Red and Greens, then I'll do my best to get it in Red and Greens. Noticiero: Interesting, Miiir has always been hesitant to open a shop in neutral towns because it was thought to be less profitable. Noticiero: How did you convince the franchise to consider opening shop here? Laikki: Take a walk through Borealis one evening when people are heading into the bars or off to Neuters or Reets. You'll spot at least a hundred people wearing the stuff. Laikki: While we're not talking about permacrete and fixing bonds here mind, they still only have an interest. It's about finding the placement for it first. Laikki: Something that'd need planning permission once I make mayor. Laikki: But yes, they're interested, and I'm more than willing to try my best to get them here. Noticiero: What are your thoughts about the other candidates for mayor? Laikki: They're all viable choices, seem to have their heads screwed on right. Felkios seems a little headstrong, but that's to be expected from his background. Laikki: It's a case of that person being a capable conduit for the people's voice, something which I'm not too sure on from their perspective since I'm not them. Noticiero: What about Miss Mittzy? some have thought she does not have the...experience for the job. Laikki: But I've spoken to alot of people in Borealis, before and after the presentations that took place earlier this week, and I will try my utmost to ensure that both I and my council are keeping the people's voice at heart. Laikki: She seems a little too laid back to be a leader in my opinion, some might say she's Dante Karall's puppet since he lost the Newland Elections and is attempting to get a hand in this one. Noticiero: Borealis right now seems to be the most populated neutral town, do you think the Newland City Council and Mayor Toog will become a rival to the Borealis City Council? Laikki: Course not, I've spoken with Mayor Toog on a few occasions and I'd love nothing more than to work with him, after all two heads are better than one. Laikki: I'd love to see all neutral territory flourish as much as the next neutral, without leaving any part of it behind, just because I lead Borealis doesn't mean I can't help out elsewhere. Noticiero: Now for some more personal questions, if you don't mind. Laikki: But yes, I am single. I'm more of a career woman. Noticiero: Have you ever had any...how can I say this...relations with a clanner or an omni? I ask this because some may use it against you if so, better to bring it out in this interview I would think. Laikki: I've spoken to Clanners and Omni-Tek personnel, but I've never gone out with anyone or anything like that. I've only dated off planet. Noticiero: You said you're single, but you didn't mention if you're seen anyone currently, is there a special man, woman or atrox in your life? Laikki: At this time, no there's not, I've been single for the best part of about three years now. I want to get this city sorted first before I think about dating again. Noticiero: You seem dedicated. Do you have any children or immediate family residing in Borealis currently? Laikki: My Mother and Father live in Borealis Backyard Four. Leanne and David Laikki. They've been in this city for the best part of about 30 years, they lived in Stret West Before that. Laikki: Mum's worked in Reets for a few decades now and Dad's a guard over on the ICC Shuttleport. Noticiero: I see, strong family ties within the neutral community. Noticiero: In your campaign, how far would you go to get votes? Laikki: No further than what I think is reasonable, with all due respect. Laikki: talking with people individually, attending meetings, rallies, making sure people are aware of who is standing for Mayor. Laikki: I'm not going to promise that Borealis will be filled with oh...what was it...&quot;Oh Em Gee Zed. Lazers. Pew Pew&quot; or whatever that proposal was. Noticiero: Will you be mentioning your rivals weaknesses against your strengths? Laikki: If they want to tell you, that's their decision, I'm busy focussing on the people, getting their ideas into my head and making sure I'm hearing them rather than trying to get dirt on my opponents and slate them. Laikki: The Neutral People have got better things to listen to, and I've got better things to do with my time. Laikki: Like planning the future of this city. I don't know the other candidates as well as I know myself, so I can't truly comment on them. Noticiero: In closing, is there anything you'd like to tell the people of Borealis? Laikki: Just to make sure that whoever they choose, make sure its someone who's willing to listen. 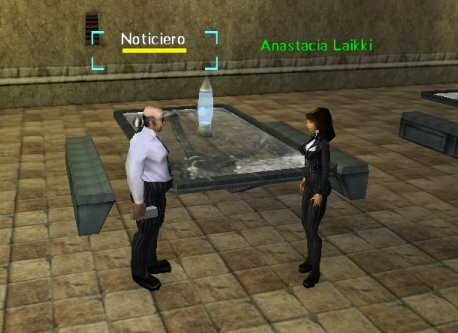 Noticiero: Thank you for your valuable time Miss Laikki. Laikki: and thank you Mr Rivera. Laikki: It's been a pleasure, I'll be seeing you sometime later no doubt? Laikki: See you around Mr Rivera. Noticiero: I try to be where the news are. Miss Laikki seems to be a mature and serious woman, with financial connections on Rubi-Ka and offworld which makes her a formidable candidate for the voters seeking to bring Borealis to a more prosperous state. However her support for the NLF may be based more on number of votes than true support for the well known nanomage organization. The NLF is considered a terrorist group, however within the neutral community they have strong political strength for being one of the oldest neutral organizations. How will neutral voters feel about her outside corporate connections and her claim to back the NLF? only Borealis residents will be able to answer those questions, with their vote. Be sure to stay tuned to your local gridfeed for upcoming meet &amp; greet with the candidates.